Vicks VapoRub is topical ointment manufactured by Vicks, one of the most widely used home remedies for a variety of health concerns. The active ingredients in VaporRub include camphor, eucalyptus oil and menthol. These agents make VapoRub available to the uses on the throat and chest as a cough suppressant owing to common cold as well as on the joints and muscles as a topical analgesic. This product is available in regular and lemon scented varieties. There are many uses of Vicks VapoRub which makes this product one of the most widely used home remedies worldwide. Apply to the Chest and Throat. The power of Vicks to decongest the chest is legendary. This remedy has been used for decades and provides excellent relief of cough, cold and congestion caused by common illness. Apply to Your Feet. The menthol stimulates receptors in the nose and chest and effectively relieves a cough. Vicks has been used for this purpose for over one hundred years. Apply a generous amount to your feet and cover with socks to enjoy a good night of cough-free sleep. Add to Humidifiers. Some humidifiers are equipped with an aromatherapy chamber and Vicks is the perfect way to diffuse the decongestant effects in the air. This can help ease the unpleasant symptoms of a cough and common cold. The topical effects stimulate blood flow to the tissues that helps to relief sore muscles and aches. Vicks is an effective remedy for muscles sore from an intense workout. Vicks has been shown to have anti-fungal properties and is an effective way to treat nail fungus. Apply daily and the nail will start to darken as the fungus is killed. Keep applying until the new healthy nail fully grows out. Massage a small amount into the temple area. The pain relief and soothing effects will be evident in a matter of minutes. The active ingredients of Vicks work to inhibit bacterial growth and prevent infection of paper cuts and splinters. Dab a tiny amount on the injured area once a day. Stop Your Cat from Scratching. Apply a small amount to the undersurface of furniture or hard surfaces that your cat repetitively scratches. This is a simple deterrent to save your furniture for the sharp claws. Prevent Pets from Peeing. Most pets do not like the smell of Vicks and setting an open container on or near the area of in-home accidents can deter your pet from using that area for urinating in the house. Used in Racehorses. The power of Vicks is evident by its use in the racehorse arena. Jockies apply a small amount in the racehorse nostrils to deter them from reacting to smells and the detracting odors present in the stable or racetrack. Keep Insects Away. Mosquitoes are drawn to us by our smell. Rub a little Vicks on exposed skin areas such as the neck, arms or ankles to keep these pesky insects away. Insects are sensitive to the odor of Vicks and it works as an excellent deterrent. It can also work to keep bees away from your bird feeders. Applying Vicks to a tick can help the tick release and back out. Vicks can be rubbed on the chest, throat and on sore muscles and joints. Covering the area with a warm moist cloth can intensify the relief. Be sure to keep clothing loose to allow vapors to reach the nose and mouth for inhalation. It is safe to repeat and reapply up to three times in a 24 hour time period. Do not use in any child less than 2 year of age. 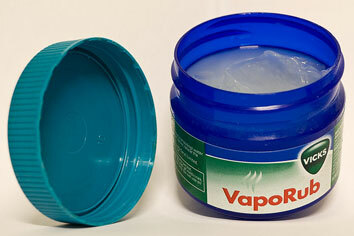 VapoRub is often used immediately prior to sleep. Follow these recommendations to avoid adverse reactions or consequences from using Vicks. Do not ingest or put in the mouth or eyes. No not wrap tightly under bandages or dressings. Keep it out of the nose and on large or open wounds. Do not heat up or microwave Vicks. Avoid adding hot water to a Vicks container as this can result in splashing and skin irritation or burns. Although VapoRub has plenty of benefits and can be used among most people, there are also several safety concerns need users to pay attention to. Vicks VapoRub can cause irritation of the skin resulting in redness, itching or soreness. The active ingredients can irritate wounds and open skin in sensitive individuals. Exposure to the eyes will result in tearing and burning. Excess heat can amplify these side effects and local reactions. One study reported that Vicks caused increased mucus production and congestion making breathing more difficult. Vicks inside the nose has occasionally caused distress and significant trouble breathing. This problem seems more common in those that have underlying lung problems and children with reactive airways such as those with asthma. Camphor overdose can occur during accidental ingestion. Camphor is irritating to the stomach and also irritates the throat and mucus membranes. Serious side effects include muscle spasm, twitching and even seizures. Other serious effects include vomiting, intense thirst and in worse case, loss of consciousness. Vomiting should not be induced as the camphor will cause additional irritation if vomiting occurs. Accidental ingestion should prompt evaluation in the emergency room. Anyone experiencing side effects should stop using and remove Vicks from the skin and seek advice from a doctor. If a cough or cold lasts longer than 7 days, or excess phlegm, shortness of breath, chest pain or severe headache occurs seek care from a doctor. Persons with chronic lung conditions such as asthma or COPD should ask their doctor before using Vicks. Pregnant or breast feeding women should ask their doctor about using Vicks. Always keep medicine and over-the-counter remedies away from children. In the advent of an accidental ingestion seek medical help and contact your local Poison Control Center.